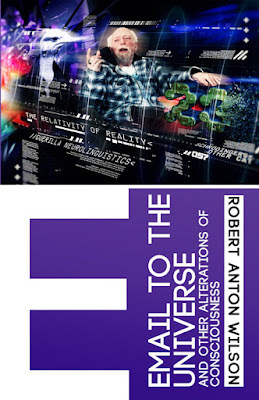 The new Hilaritas Press paperback of Email to the Universe has now been published, making it available to those of you who want the paperback rather than the ebook. Please note that it will take a couple of days or so for it to replace the New Falcon edition on Amazon's website. But if you want to order it right away, you can do so now at the Amazon CreateSpace link. And if you are planning to buy the book, even if not right away, you should probably go ahead and use the CreateSpace link, rather than buying it from Amazon's main website. Richard Rasa says, "The RAW Trust receives a much higher royalty for all sales through the CreateSpace store. No idea why. It certainly is not as fancy a page as the regular Amazon Sales Page, so maybe there’s a lower overhead? That’s one piece of pasta I can’t get a focus on." RAW Trust royalties benefit RAW's heirs. The new edition is superior to the older New Falcon edition — it has new material by Michael Johnson and Paul Krassner and better illustrations — so you'll want to make a point of making sure that's the one you buy. When the book becomes available at Amazon's main site and other locations, there will be an announcement and I'll note it here.